Do You Need to Wash New Sheets? Many customers who buy new sheets, duvet covers, and the like often wonder if they should follow the instructions written on the product cover regarding washing them before use. Well, why do you need to wash new sheets before using them for the first time? What will happen if you don’t? Maybe you are also wondering if washing them might affect their size and color. Or maybe, you also want to know how to do it properly. Allow us to provide you the answers to these questions. When you buy fresh bed sheets, you will notice that they appear crisp and clean as they are neatly folded to make them attractive in their package. The purpose of this is for sizing, but what maintains this attractive state is the presence of chemicals like formaldehyde, butane, and propane. These odorous chemicals may be harmful to your skin and body, so be sure to wash your new sheets at least once to remove these chemical residues. Remove the new sheets from their packaging and toss them into your washing machine. For large bed sheets (queen size / larger): Separate the top from the bottom sheet when washing to give each one more room in the machine. To remove the chemicals on the new sheets, use one cup of baking soda instead of your regular laundry detergent. Detergents can lock in the chemicals to your sheets and make them stiffer, so avoid using them. Using warm water, set your washer to regular cycle and turn on. During the rinse cycle, adjust the water temperature to cold setting then add one cup of white vinegar to the water. Vinegar helps soften your sheets, but you may omit it if you want. Baking soda works well on its own. 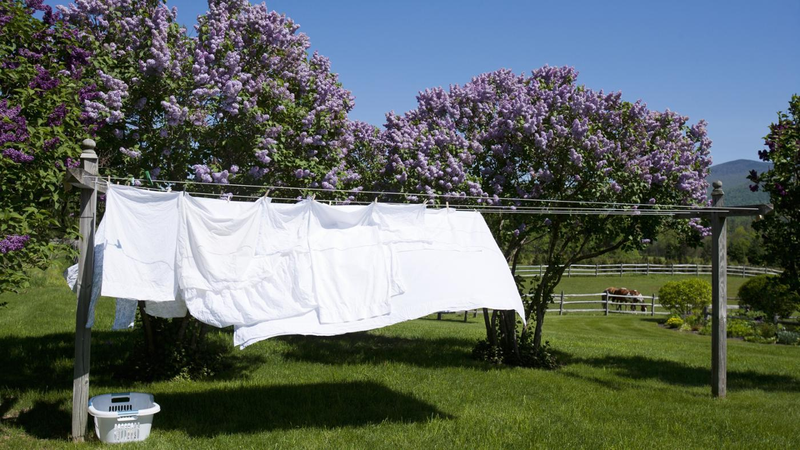 After rinsing, remove your sheets from the washer and hang outdoors to dry them under the sun. Drying under the sun helps soften your sheets further. However, if you do not have space outdoors, use the dryer instead. Use a low setting to avoid shrinkage of your fabrics. Again you ask, “Do I have to wash new sheets frequently?” Yes, wash and change your sheets at least once a week. If you have allergies, you may need to wash them more frequently, especially during the summer months. Warm weather can cause night sweats, so washing your sheets regularly is best. Deep pockets help make the sheets stay in place while tucked under the mattress compared to regular pocket sheets. Choose deep pocket sheets to ensure you don't have to adjust your fitted sheets back into place. You can also use straps under the mattress to prevent the corners from coming loose and to hold your sheets firmly in place. Follow label instructions when drying and remove them before fully dry to reduce wrinkles. However, make sure your sheets are really dry before you store them to avoid growth of mildew. Iron your sheets if you have the time to make them good as new again. Line the surface of the drawer with acid-free tissue paper to help keep the fabrics from yellowing. Do not store them in plastic containers where moisture can be trapped and mildew growth can occur. Some believe that higher thread counts mean better quality, but some say that a 200 to 400 thread count is fine. It is important to note that some manufacturers use double insertion method, where two to four threads are twisted together before the weaving process. This does not result in having more threads per inch nor does it produce softer sheets. It is better to consider the cotton quality, so look for 100% combed cotton, to get finer sheets compared to carded cotton. Avoid using fabric softeners if you have problems with discoloration or yellowing. Liquid softeners and dryer sheets just cause build-up, which make these problems worse. Synthetic fabrics often bear stains. Consider buying sheets made from 100% cotton, and you will find that they are less likely to stain. For problems with grease or oil stains, replace your regular laundry detergent with grease-fighting detergent used for washing dishes during the wash cycle.